So I was completely off on my Bloglines count…I had about 200 in my “Children’s Literature” section and almost 400 in my “Food” section…most of them as a result of Mr. Ruhlman who had 140 posts or so alone (which I think might have been a mistake...because when I went to his site, there were only 2 posts I hadn't read). Phew! But this concentrated, fast reading of all the posts has been rather fun…though I will try in the future not to repeat it. On one hand, I know I’m not the most consistent, most articulate blogger out there, or even remotely close for that matter. However, in my sassier moments, I satisfy myself knowing that the biggest reason I’m not a blogging star is because I totally have a life away from the computer. So…um….there. Yeah. -- Book Club Girl has a post about Bastille Day and some book recommendations for Francophiles (though it’s a very brief list…I’d like to add Gastronomical Me, Paris to the Moon, From Here You Can’t See Paris, among many others…). You have ONE MORE DAY to take advantage of wine.com’s 1-cent shipping on French wines, in celebration of Bastille Day. -- Confections of a Foodie Bride has a queso dip recipe that sounds like the perfect thing to eat on my balcony on a hot summer day. With a mojito. 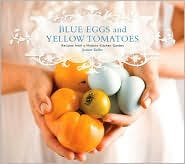 -- Cream Puffs in Venice pimps her new favorite cookbook: Blue Eggs and Yellow Tomatoes: Recipes from a Modern Kitchen Garden by Jeanne Kelley. I have bumped this cookbook to the top of my list – I’m such a sucker for beautiful food photography. -- Need yet another reason to buy local produce? -- We Are Never Full, once again, has me in stitches…even when asking a legitimate ethical question about our food and humanity. And who says there's no wildlife or nature in the Big City? -- This isn’t necessarily food-related, but I’m in love with Simple Things Made Great. Amy talks about two things we could all use more of: great summer music and improved life quality. I'm madly in love with anyone who names their playlists "The Sky is Open" and "My Heart is Bursting." Last but not least, the kiddo is being delivered by my mom to JFK airport tonight and I am ecstatic. Even if that means I now have to give an explanation for every speck of green in every dish I make. Eat, drink, and be thankful for time with your family. My favourite childrens literature has always been C.S. Lewis and the Chronicles of Narnia. I practically wore them out borrowing them from the library wjen I was a kid and of course Ann of Green Gables from Montgomery. I visited her home in Uxbridge, Ontario when I lived in the area.